Designing Windows is no easy task. Tjeerd Hoek (pronounced “she-sells-sea-shells-by-the-sea-shore”) leads the design team whose resulting product used and seen by millions of people around the world. It’s a product without cultural, geographic, economic or language borders; which happens to be an insignificant product launching today. After graduating in the Netherlands, Tjeerd joined Microsoft to work on many products including Office, MSN and most recently Windows. I caught up with Tjeerd at CES 2007 to ask a few questions. Q: So tell me about your role at Microsoft? I’m officially the director of user experience design for Windows and I manage the team that designs the interface. For the last five years, the full focus has been on what was called Longhorn, now Windows Vista. Q: Why did you choose to work at Microsoft? After I graduated in 1992 with a background in industrial design, engineering actually, I had my own little design agency. I was looking for industrial products to go design, but had also done this project around Virtual Reality for my graduation project, and that had really raised my interest in computer-human interfaces. At some point I thought if I really wanted to do something meaningful and design products that are being used by lots and lots of people, I should probably go work in the United States with companies that build products that are being used by millions of people. I applied for a job just out of the blue from Holland to Redmond, went over there and loved it. Thought the people were very interesting and highly passionate, so I joined the company. Q: How big is the design group for Windows and what do you guys do? Well we have a large group of product designers, about 30 or so people, and they work across the Windows division and other groups almost as an internal design agency. These are product designers with a background in either interaction design, graphic design or industrial design. Many of them are also pretty senior, they’ve been with the company for quite a while and the work across the Windows organization and the organizations that build applications like Windows Media Player or photo application, like Windows Photo Gallery. Our job is to ensure that the user experience across all those pieces is holistically thought through. Not only in terms of the aesthetics, but how it works and how people will actually use the features that together make an end-to-end scenario. Q: When did you start working on Longhorn? We started around 2001, pretty much right after Windows XP. We started building a new user experience team which involves both user research and design and we really expanded our role in the sense to cover all the products involved in the user experience. We’ve basically been focused on developing the new look and feel, design all those features and making it real. For the last couple of years we’ve been mostly in that state of making it real, go build it, all the implementations and etc. Q: Would you say there was a big change from the Longhorn vision to realizing Vista? No actually, from a user interface perspective we quickly understood that we could deliver most of the features that we had envisioned and had been developing with the technologies already in process. We are very happy with the end result. We feel we totally delivered on the vision we had in 2003 when we were creative-complete. Q: Was there anything you would have really liked to be part of Windows Vista, but wasn’t possible due to time, cost, quality or management constraints? Well, developing something like this is always an evolutionary process. With any development process, there are always constraints like time and resources you have to consider. So from the point of view of the designer, you aim here (points high), realise this (points middle) and then you turn toto the next version or the next product release to focus on, and you work hard. There’s no real particular examples for me stand out as “oh yeah, we really had to drop this one or something”. Q: Legacy support seems to be the biggest constraint holding Microsoft back. How do you deal with it from a design perspective? First of all, I don’t really think about it as much as legacy support, because that always sounds like “you have to support all this old stuff that’s there” and you can’t just do something completely new and revolutionary, right? There’s so much change people can have. For example, if you come up with a great way of steering a car that doesn’t involve a steering wheel, that might be very revolutionary but you’re not going to sell many cars. We have to find a balance. It’s not so much a legacy problem as it is the reality of designing products for lots and lots of people in the real world, who do real things with it. The second component to this is of course we have a very large and very diverse ecosystem with lots of different people using Windows for lots of different purposes on tons of different hardware. That’s a large part of our success actually; the flexibility and scale of this whole ecosystem. Basically, that success also gives us the responsibility and a variety of considerations to keep in mind. Sometimes you can not exactly get what you want, because the market isn’t there yet. You have to take small steps to get to that vision, and that’s okay. Q: Who influences design at Microsoft? Do executives or designers have the final say? Microsoft has a great environment in the sense that many people who are part of the product development process are really empowered to contribute ideas and to have influence. It’s almost like it doesn’t really matter what your title is, if you have something to contribute or something smart to say and you work hard, then you can have an impact on stuff. User research can do that. Senior vice president can do that. It’s not like there’s one major decision maker or one person holds the vision and everyone has to listen to that person. That’s just not the way it works. Q: Windows XP icons were designed by a third party studio, IconFactory. Who designed the Windows Vista icons? The development of the design and styling was done in our team, in collaboration with various artists outside who were directed by our creative leads. This was a process in which we were looking for the right style, overall look and level of detail in these icons, as well as various different execution methods for production. We knew we wanted to make a lot more of these than ever before so we had to really find a sweet spot in terms of cost. After this process was done, we had our style which was part of the overall AERO experience design. Then in later stages, the project moved to full production. Most of the actual execution and all the hard work to bring the quality we wanted to this huge set of illustrations was done in our own design team, in collaboration with various production facilities on or off campus. Icons are not only difficult to do well, but given the resolutions they are now, they are really substantial illustrations. There’s a lot more to it than just making some cool images. Most of the work goes into knowing what is really needed, what an icon needs to express, how it fits in the overall system, etc. And then getting all the artwork in to the code. At our scale, this is all very challenging so we’re very happy about how much we got done across the entire the user experience. Q: What applications do you use during the design process? What do you think of Microsoft Expression? In a way, our designers use whatever works. They have a variety of tool sets, from paper and pencil to high-end prototyping tools. Of course Photoshop and various other Adobe tools are a given and used a lot. I think the new Expression tools are very compelling for the future. It’s also good Microsoft is pushing a bit in this space. Now, many people with various backgrounds want to do more than just write code, but create an experience for their customers and users. It is compelling to think of the prototyping tools used by design are becoming more integrated with the tools used to build the actual interface in the final product, with more separation of underlying logic and UI code. Q: With Julie Larson-Green joining the Windows design team, how does that affect your position? How does it affect the design group? I have worked for years with many of the people who recently joined the Windows organization from the Office team. Many of them are friends of mine, so for me, this is a bit of a reunion. Our team will continue to work with all the product team and various disciplines in the Windows User Experience organization and related product efforts to create a great user experience across all those pieces end to end. The vision for user interface models, innovation and ‘successful solutions’ is the same for all of us. The design group itself is now even bigger than before and carries a broader set of responsibilities. There are a lot of opportunities for all the designers and user researchers in our team to have impact on many important product efforts, both short and longer term. Q: Have you ever owned a Mac? And what do you think of Apple’s design philosophy? My first computer was a Mac actually, Mac LC, loved it. I still have it in fact, but as an ‘object’. I don’t use Macs anymore. I like what Apple does, especially with hardware. They have a slightly different approach to product design than we do, which makes it a bit easier to deliver more optimized solutions. Some people would say better, but that really depends on how one defines that. I think Windows really is very strong in many ways, and Microsoft has a pretty good grasp on great interaction/UI design. And there’s a lot of myth around Apple’s UI strengths. I don’t know if I know their ‘philosophy’ as you say. They want to build great products people love to use, and we’re in that same business, with some different constraints and priorities. They hold quality very high, and with Windows Vista the entire organization has done so on all aspects of the product as well, especially also with regard to the end-to-end design of the user experience. In the end we make some different trade-offs, and have a much more diverse and complex ecosystem to always deeply understand and take into account. We have a lot bigger user population, platform and market. If designers don’t like difficult trade-offs and major reality-checks, our world is definitely not for them. The great thing is, what you get done makes so many more people’s experience with the product better. The opportunity for impact is huge. Q: Are you getting a Nintendo Wii? I think so. I love what Nintendo is doing there. If they have cool games for my two kids, I think I would be into it. I love immersive environments and the blending of the real and virtual. My masters degree project involved virtual reality and that’s where my interest in interfaces and interaction design really started. So seeing the gigantic machines we played with in the labs at the time, come to the living room in this small box is pretty amazing. Q: Will we ever see a vector-based user interface? This vector-based UI idea is often a bit idealized as if it’s some Holy Grail. Many people seem to not realize the downsides or shortcomings and trade-offs, but there certainly are UI parts where vectors will start being used. Whatever works best, is cost effective in production, provides most flexibility and performs fast, we’ll use. Q: Did Aero Diamond ever exist? It really is much less than what the community made it into or thought it was. It was mostly a codename for next step efforts on the DWM (Desktop Window Manager) and the more high-end UI effects, which we’d look at after Windows Vista would be done. And that’s in many ways what will happen anyway. So in a way, it’s just a codename, no longer used for things we’ll consider for the future user experiences. 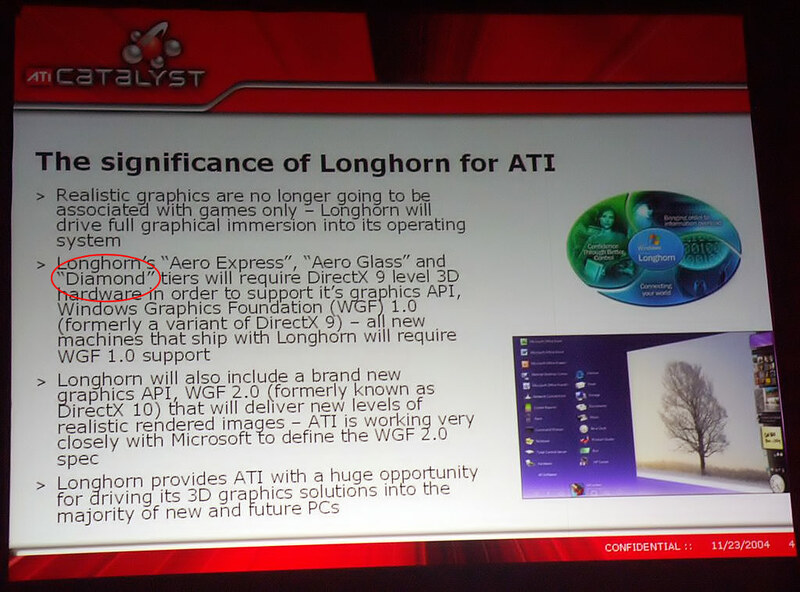 Note from Long: What about the infamous screenshot from the ATI presentation? As you can see, this was nothing more than a fancy start menu animation that was being demoed. The idea was, by clicking on the start menu, your desktop would be shifted to the right in perspective and your start menu would slide out from the left. This allowed to full view of both the start menu and desktop without overlap, however it also meant unnecessary animation time between clicking the start menu and being able to interact with the start menu, thus appropriately dropped. I want to thank Tjeerd for taking time out of his busy (rock & roll) schedule to answer these questions for me and also Waggener Edstrom for arranging the interview. I hope it answers some of the questions a lot of enthusiasts out there are asking too. It may be very nice to work on the design of an operating system! Only geeks could get off on icons and…spend the better part of an interview talking about them. Your section lacks wisdom and innovation. Too many youngsters, too much hubris. I know my math isn’t too great, but to me that seems a little…oh I don’t know…hypocritical? If you think that reading about this stuff is ‘geeky’, then why click on the link to read it in the first place, and then have the nerve to comment on it as something you shouldn’t have to read. VISTA IS A PIECE OF CRAP! Enough said! What can we expect to see in these Ultimate Upgrades? Will we continue to see free games, or more things that increase the functionality of Windows Vista like Dream Scene? It’s “BY the sea shore” not “on the sea shore”. @zzap: If you want to get technical 😛 Corrected. Thanks. Other than that, nice interview. Another thing we should appreciate is the microsoft design’s effort on Office UI. I am using the beta for past 6 months and it is amazing… and SmartArt is the real eye candy! So what exactly is this “vector-based” UI that is mentioned? I Googled it, but couldn’t find anything that I could comprehend. @Andrew F: Think most Flash applications. These applications are built with vector shapes which allows it to be scaled to any resolution without quality-loss. At one time, Windows Vista was rumored to have a vector UI which would allow you to not only resize applications, but scale them in real-time. Of course, this was never realized. Apple’s OS X Leopard 10.5 is rumored to have a resolution-independent UI, which may or may not be vector based. The XP icons where just perfect by shape and contrast but on Vista there are so many issues like wrong perspectives, hardly recognisable shapes, too many different tones, lack of shadows, silly metaphors (orange flowers? )… The same with text: too much text and some text is hard to read (less contrast or too much of reflections). Sometimes, when I have to switch back to XP, I wonder how relaxing Luna is to the eyes without sharp reflections and good contrast in meaningfull ways (compare the title bar text in both systems!). @tino: Too early to call. @tino: You think that Vista is hurtful to your eyes? Luna is like a circus compared to Vista’s sleek designs. @mrmckeb, you are right, but reflections and glow in windows titles are hard for eyes and comprehension. Reflections are pretty, but totally useless. On the other hand, I like black titlebar and taskbar when maximized. That really helps to focus. The new icons in Office 2007 follow the XP-style icons which EVERYONE SEEMS TO LIKE. Vista icons look wonderful at larger size (128 and above). MS should start a “resource” updating project for all released binaries, dedicate developers and designers to these things…then they can easily replace ALL the legacy icons..many times you can come across some icons in XP and even in Vista which are 16-color but for which better quality ones already exist but have not been replaced. Icons in fact are one things where they can do it without breaking backward compatibility. @mrmckbeb: Luna also has a silver theme, and all elements are colorfull, yes, but with “whatercolors”, so reduced saturation. That is the best for the eyes, I think. One fundamental rule of ui design is: no white text on black background! ((best is black text on subtle yellow)) And with only black titlebar and taskbar beside a white browser window your eyes will hurt; too much differences. Whats also interesting is that MS goes now the Aqua way of design (by overacting it) and Apple starts to copy Luna (look at iTunes 7, for example). The Microsoft design team should be more self-confident on what they have done for 95 and XP. Many people hate the “Fisherprize” style in XP, but that does not mean that it is a bad design after all, only a bad style. I really liked the “logic” behind Luna, there was a basic concept: 3d-elements are clickable, red for close, green for start and so on… they even released the Photoshop setting for icons’ soft shadows! (in Vista: some icons got a 3D shadow, some 2d, some none) So, I dont see a clear concept behind A.E.R.O. and the quality is not very good. @anonymus: Thats right. But whats really strange is that they know every single old icon in Vista. A developer confirmed that on the “Shell revealed” website! That are the things that drives me crazy. Why in hell they designed different “arrow down” buttons for all the same “fold-out” details bars in the whole system if they haven’t enought time for all the icons?! a very interesting interview , especially about aero diamond . maybe u can ask tjeerd if he can share the wallpaper used in that demo ? @whatever: I’ve removed Snap Previews. Are you related to Ren Hoek? Brilliant stuff. I have said it over and over again that windows Vista is the most beautiful operating system i have ever laid my hands on.